Brace yourself for an adventure-packed day with our all-in Mount Daraitan tours. 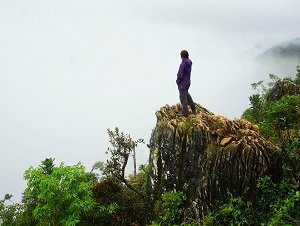 Test your body's limits as you scramble your way up its 600-meter slippery slope to reach its karst-filled summit where you can have the perfect vantage of the dreamy sea of clouds and of the Sierra Madre. As an added bonus, you can descend towards the Tinipak river where unbelievable jagged limestone formations can be found. They look like cracked boulders from afar, hence the name. With its clear waters and natural pool areas within the caves, it is easy to understand why weekend-warriors flock here. Swim to your heart's content and find your pocket of adventure space in the area. 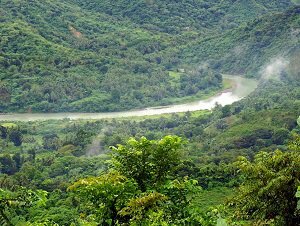 From its mountain to its river and its close proximity from Manila, this place will not disappoint and is definitely worth the day-trip. So pack your bags now and book your adventure with TRIPinas. TRIPinas offers affordable private day-hikes that are perfect for your budget and schedule. Whether you're coming from Manila and in need of a transport service or you prefer to drive all the way to Tanay in the province of Rizal, we can definitely help you on your adventure needs. If you start from Manila, your group will be picked up at the pre-determined point. Our all-in package includes an accredited tour guide (one for every five hikers) and all the required entrance fees and transfer fees. Meals are not provided so bring your favorite trail chow! Make sure that you are wearing a pair of shoes that have a good grip as the trail is slippery and muddy. If accessible, you can also go and swim at Tinipak river after hiking to the summit so don't forget your swimwear. All of the guides are friendly and are knowledgeable of the trail and the local culture. Have a more meaningful trip by engaging them on a conversation to know more about their way of life and how they protect this majestic place they call home which they generously share with us world-weary city dwellers. 1330PM Return at the base camp. There are several ways on starting your Mt. Daraitan adventure with us. For general information, we will outline here our most popular itinerary that starts from and ends in Manila with a transport service provided by us. The ideal pick-up time from Manila is 1am. After a thorough briefing, you will all board the van and travel to the riverbank of Bankerohan. The vehicle will stay here so make sure you have all of your gears before you cross the river with you as you won’t return to the van until the afternoon when your tour is done. From here, you will go to the other side of the river by taking a small makeshift bamboo catamaran. At the other side of the river, you will transfer to a tricycle to go to the tourism office where we are required to sign-in. This is also where we will meet our local guide. Guide to climber ratio is 1:5. There are several cafeterias in the area where you can buy your breakfast, trail food and packed lunch. There is also one toilet/shower facility in the office. Please use them before the start of the walk. The trek will take about 3-4 hours from the jump-off to the rocky summit. The trail can get muddy and slippery especially during the rainy months. 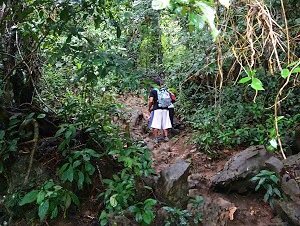 Those who are new to hiking may find the gradually sloping trail a little challenging. We highly encourage that you bring a hiking stick to aid you on your trek. Around 6:30AM, you will reach the peak. Appreciate the summit views --- you deserve it! 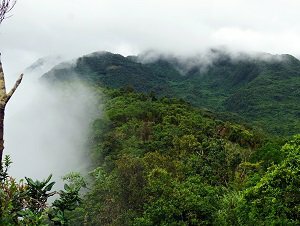 If blessed with good weather, you will be treated with a panoramic view of the majestic Sierra Madre creating a perfect ambience for your early lunch. After a scrumptious one hour meal at the summit, start heading down to Tinipak River. After about a 4-hr hike, you will finally get to swim at the clear waters of Tinipak river. Be careful as the rocks are slick! We’ll have about an hour of free time here before we start heading back to the tourism office where we can wash up. You can also buy your food for the ride back home as there won’t be any stop-overs. After packing everything, we will ride a tricycle back to the river which we need to cross again using the same catamaran. Board the same van which will take you back to the same point you assembled in the morning. Estimated time of arrival in Manila is around 4PM. - The waters of Daraitan river is considered as the cleanest inland body of water in Calabarzon region? Let's help keep it that way. 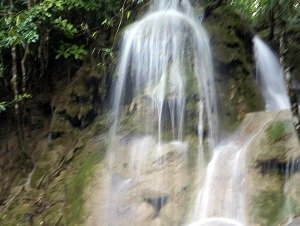 - The Remontado Dumagat is the name of the indigenous group of people who live in this area. They are usually found between Tanay, Rizal and General Nakar, Quezon. - Tinipak rock formations are marbles naturally carved by water. It is derived from the Tagalog noun tipak, which means "a chunk or block of". ❶ Are your packages beginner-friendly? YES! The trail is relatively manageable to navigate. It does get a little tricky when it just rained because the slope can be slippery/muddy. We do encourage our guests to bring a trekking pole and a positive disposition to finish the activity. ❷ How strong is the phone network? There is none on the trail and weak at the summit. Which can be a good thing if you really want to disconnect from the stress of work. ❸ Are there water sources on the trail? Not really. But you can drink from Tinipak river as it is pretty clean. ❹ Do you accept kids/ senior citizens? Kids at least 10 years of age are welcome provided they are accompanied by a parent/ legal guardian. We're always happy to have senior members of the society during our hikes. It would be prudent to check with your family doctor if you're good to go on an outdoor trip. ❺ What are the essential things to bring for this trip? A small back-pack, 2L of water, trail food, packed lunch, hiking footwear (shoes/sandals with a good grip), walking stick, swim wear for Tinipak river, headlamp for caving/spelunking, extra set of clothes, water proof camera (or camera in a water-proof container) extra cash for miscellaneous expenses.